5-Star Tilapia® seasoned with a classic blend of real herbs and spices. Spice up your next meal by bringing the taste of outdoor grilling inside your kitchen. 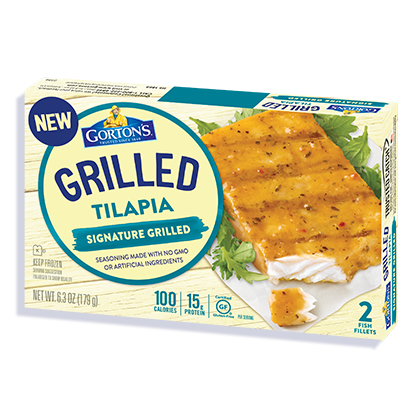 And at just 100 calories per fillet, our Signature Grilled Tilapia is high in flavor yet low in guilt. 3. Bake for 18-20 minutes*. 2. Microwave 1 fillet on HIGH for 3 to 4.5 minutes*, or 2 fillets for 5 to 7 minutes*. Water, canola oil, potato starch, sea salt, garlic powder, spices, dehydrated red bell pepper, paprika, onion powder, whey, parsley natural flavor.